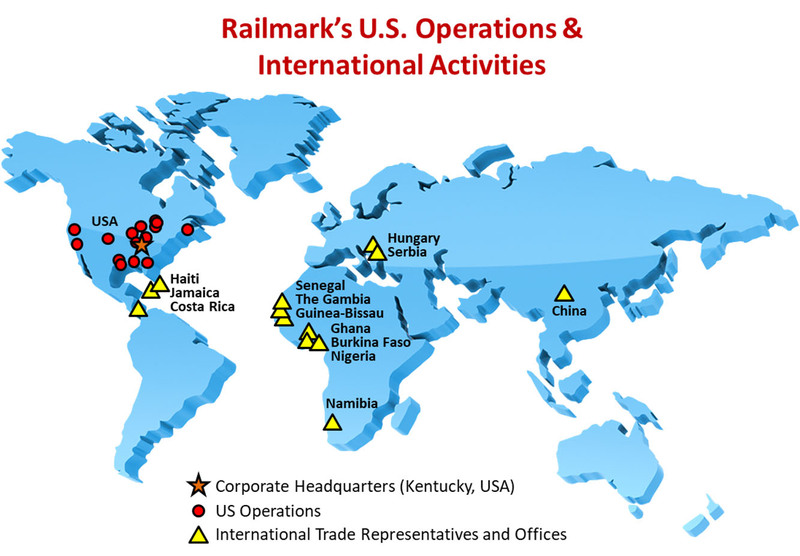 Railmark’s railroad and rail service operations are in the U.S. and Canada. The Company has Trade Representatives in 13 countries around the world. Railmark has provided rail consulting and other rail services around the world and enjoys direct rail systems experience, direct rail-related services experience and logistics experience in over thirty-five countries outside of the United States. Railmark has a team of thirteen (13) active local trade representatives in Africa, Caribbean, China and Europe. Through Railmark Logistics (RRS), Railmark provides shipping and logistics services from points in North America to points around the world. Railmark can provide a complete, turn-key rail development solution in any part of the world. Railmark Africa Inc. is a U.S. domiciled holding company structured to own and operate Railmark's locally domiciled railroad operating subsidiaries on the continent of Africa. Railmark's first project in Africa was in 2007 for the Republic of Ghana and Railmark's presence and experience has grown ever since with the Company's unique rail centric economic development models and rail modernization programs. Railmark, since its inception, has been mentioned publically its support for rail development in Africa and was quoted twelve years ago in a major railroad industry publication stating that "Africa is the last frontier of opportunity for rail". Railmark’s rail development and rail economic strategies have shown that the greatest opportunities for investors and those interested in assisting with Africa’s economic growth, lies in a Railmark strategy that centers on rail transportation.